Tim will be giving the opening keynote at the AI Masters conference on January 25, 2018 in Berlin. Falling sales, programmatic advertising and automation, the power of digital platforms, algorithmic communication and analytical and increasingly creative tasks delegated to AI: the marketing industry is (again) in a crisis. This time it’s all about the big picture: who needs brand creators and marketers if supply and demand can be calculated precisely and artificially controlled? 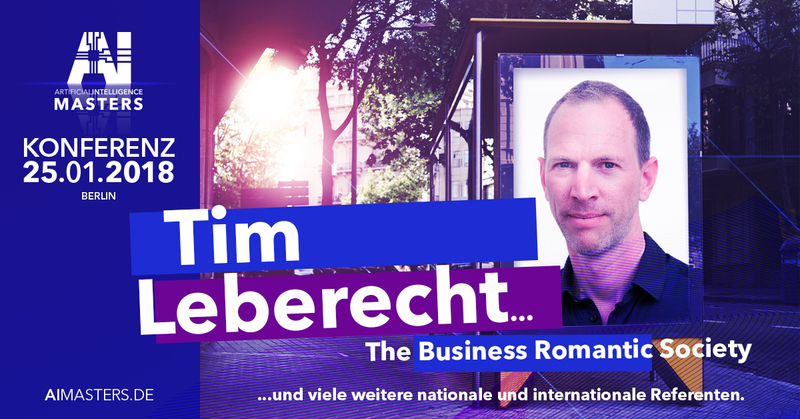 Tim Leberecht, author of the international bestseller “Business Romantic” and founder and co-CEO of the Business Romantic Society, believes in a new romantic era. In his lecture he presents four principles for human brands in the age of machines. Companies and brands that emotionalize and act as a source of meaning and enter the market with purpose, dedication and empathy – in other words, with humanity – will become luxury goods. If they not only deliver, but also inspire and provide orientation like artists, they create not only long-term loyalty in fast-paced times, but also real social added value. The AI Masters is the AI conference for marketing and e-commerce decision makers in Germany. National and international AI experts share their experiences in selected lectures and discussions.